Upper Valley Land Trust, Vermont Earth Institute, Vermont Chapter of the Sierra Club, Sustainable Hanover, League of Women Voters of the Upper Valley, and Greater Upper Valley Solid Waste District will co-sponsor the film Garbage: The Revolution Starts at Home on Tuesday, June 23rd at 7pm at the Howe Libraryâ€™s Mayer Room, Hanover. This 76-minute documentary features the McDonalds, a husband, wife, and three young children from Toronto, who agree to star in the film as guinea pigs by storing three monthâ€™s worth of garbage in their garage. 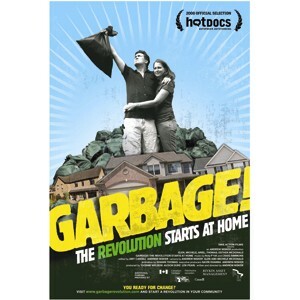 The film explores the origins of the McDonaldâ€™s garbage and traces its path once it leaves their garage. Director Andrew Nisker takes the viewer to landfills, recycling centers and to the heart of Torontoâ€™s multi-million dollar â€œwet garbageâ€ processing plant â€“ a place where city residentsâ€™ food scraps, paper towels and kitty litter are all processed into composting material. For more information about Garbage see http://www.garbagerevolution.com/. There will be a short discussion following the film; attendees will be encouraged to think of ways that they can take action to reduce our garbage. The event is free and open to the public. Bring your bowl and cup for free popcorn and drinks. For more information contact Barbara Duncan at vei@valley.net or 802-333-3664.